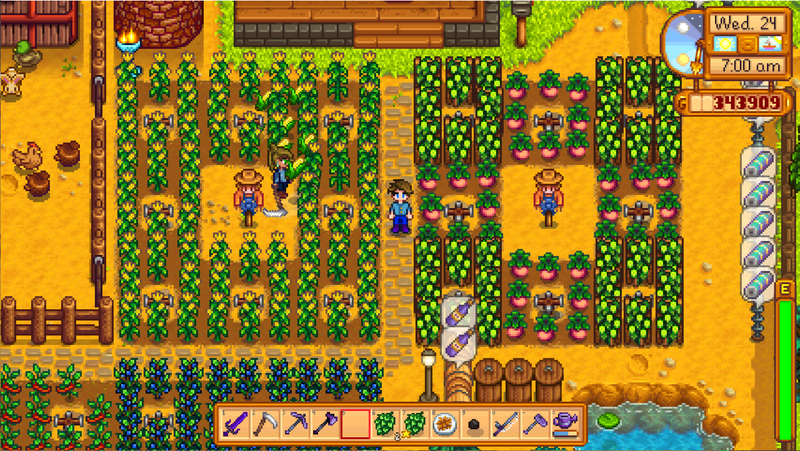 Steam farming sensation Stardew Valley finally has multiplayer! Well ... unofficially, anyway. Stardew Valley players have been waiting for multiplayer since shortly after the game came out in February, but that particular update is still a seed, rather than a blossoming pumpkin patch or a field overrun by sprightly Pokemon. It might be in the game "early next year," according to creator Eric Barone, but we'll see. For those who absolutely cannot wait any longer, spacechase0 has released the Makeshift Multiplayer mod. It lets you and your friends play together, albeit in some oddly conjoined ways. You share a wallet and relationship progress — so it's basically an episode of Sister Wives — but inventories, skills, and even house interiors are your own. There are also apparently issues with holidays, and only the host can pause time. So it's basically an episode of Sister Wives. Still, it's playable Stardew Valley multiplayer, and that's something! I'm patient enough to wait for official multiplayer.